• Doors close and lock with shelves in either position. • Recessed, molded-in handles are placed inside the swiveling end for easy, safe movement. 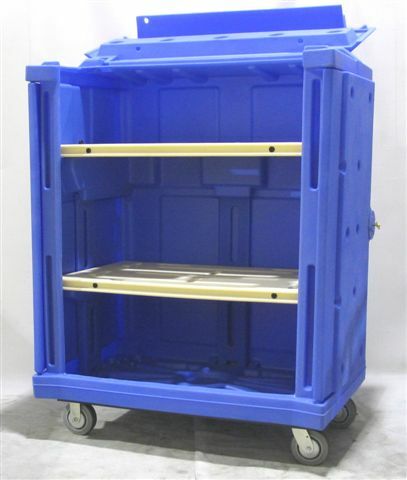 • Open doors swing 270 degrees and snap into sides of cart to maintain sleek profile and fit into tight spaces. • Double-wall, molded doors with high-grade stainless steel latch and security lock safeguard goods. • Split hinged top opens for ergonomic access to linens, seals shut and locks for over the road transport and security. • Double wall construction withstands repeated use. • Industrial grade 6 casters withstand constant, punishing operation. • New all-plastic base accommodates 600 lbs. without crumpling, cracking or deteriorating. Can be used in automatic cart washers. • Choose new plastic or rust-resistant powder-coated steel base.